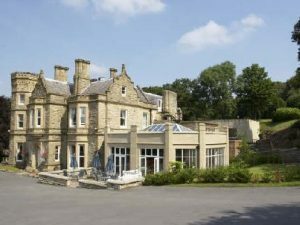 Hollin Hall was once the home of a Victorian industrialist, this lovely gothic style stone mansion has been tastefully converted into a quality hotel. Significant renovation work in recent years has enhanced the delightful public rooms. Look for the beautiful painted glass roof to the atrium above the stairs (pictured top). Drink in the friendly cocktail bar and eat in the dining room (with dance floor) or in The Ridge restaurant. 57 rooms. AA 3 star. Brews: John Smith’s, Foster’s, Guinness. Food: Served in The Ridge Restaurant – please see separate page. Other facilities: Function suite – The banqueting suite can seat up to 100 persons depending on the type of event. The basement bar is also available for receptions and discos. Finding it: Look out for finger post signs ‘Hotels’ which point the way from the main road through Bollington. Well signed entrance drive opposite Jackson Place in Kerridge. The hotel cannot be seen from the nearby road.